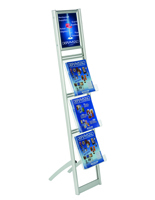 Why carry heavy or bulky display equipment when there are so many portable literature stands available? 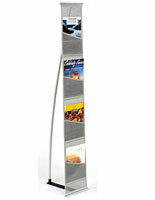 Our online collection features lightweight alternatives that are easier on the back and the wallet. 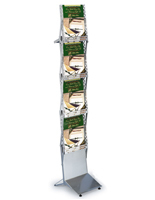 The portable literature stands, also called folding magazine racks, are sure to make exhibitions, conferences, and other big events go more smoothly. 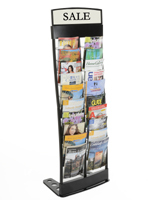 Rather than fussing with complicated or unwieldy displays, these standing literature and magazine holders collapse for simple transport. 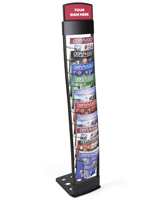 The folding literature stands and portable magazine racks come in a variety of styles, from durable metal to pliable mesh. 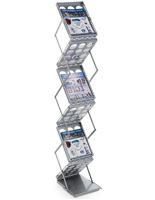 The assortment provides traveling sales representatives and company vendors with the best foldable choices on the market. 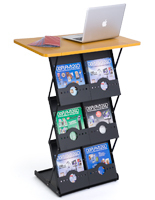 Each portable literature stand can be purchased with different pocket configurations. 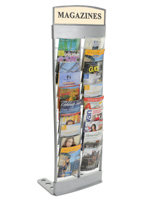 Multiple pockets help users exhibit and distribute their most important publications with no trouble at all. 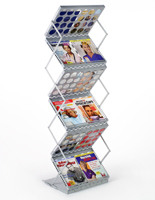 No matter which folding magazine racks are selected, the durability and low price tag will provide a lasting solution. 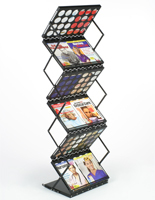 Why are folding magazine racks becoming so popular? 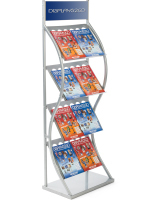 These lightweight portable literature stands are ideal for short-term and interim events. 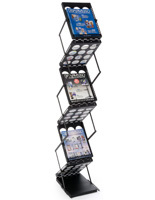 Industry expos, for example last just a short time, so most vendors and sales representatives do not want to lug around heavy display systems. 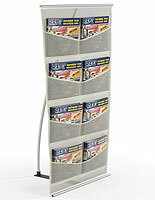 These wire and mesh stands for literature are much more effective for these types of trade events. 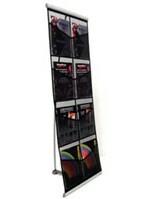 Transport cases are often included with the purchase to make going to and from events much easier. 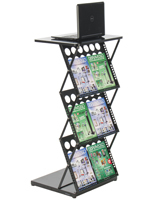 Expos and fairs are some of the most common applications, but really anyone that gives presentations at multiple locations can benefit from these simple literature distribution systems. 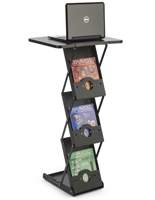 Not only is the construction of each one of these stands exceptionally durable, but also the design uses less material than other options so overall cost is lower. 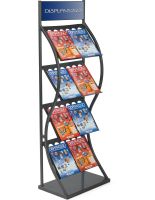 This combination of functionality and affordability is a big reason so many customers prefer transportable literature display racks. When traveling to an event, two main objectives come to mind: Sell your product and do so without breaking your back or budget displaying that product. 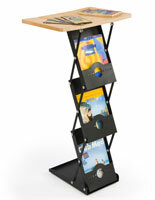 We have many portable literature racks all under 18 lbs that can be quickly carried by one person. 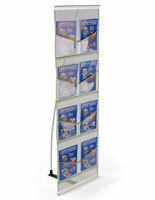 Our pop up, folding, and simple-to-assemble designs will help you get your booth up and running in no time! 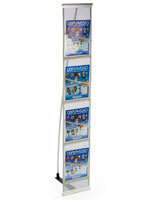 Businesses spend hundreds and thousands of dollars on marketing materials and literature to promote their business' image. 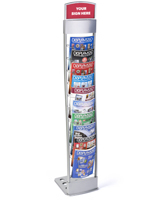 Why not get the right folding magazine stands to showcase your pertinent information? 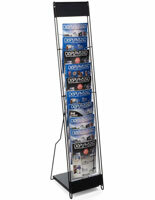 As a manufacturer, our foldable & transportable magazine displays for events are always in-stock and ready to ship. 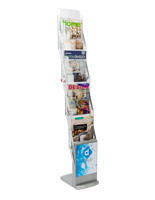 Check out our other standing magazine & literature racks in the online warehouse as well. 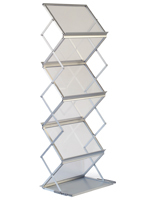 With a literature holder or catalog rack, you can make all your materials accessible to clients and start improving business today! 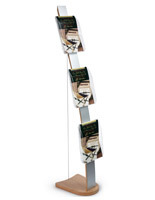 How does having the latest and greatest literature display improve a company's image? 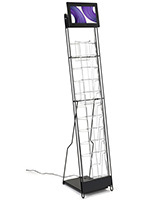 Customers can be finicky and are often set off by even small details. 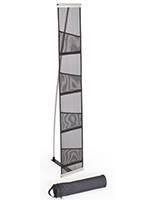 Expo booths and exhibits that are using high quality equipment frequently get more visitors simply because they show that they are serious about their businesses. Additionally, style plays an important role. 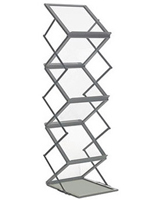 It may seem negligible but modern and contemporary fixtures can really attract a lot of sales, especially in today's fast-paced markets. 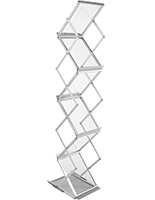 Each floor stand for literature in this collection is designed with modern appeal in mind. 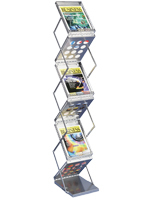 Contemporary displays often have a larger impact on the viewer, simply because it shows them you have put a lot of work into keeping your information as well as the display rack up to date. 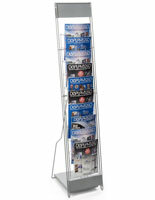 Another great feature that many of the folding literature stands and portable magazine holders supply is a carrying bag. 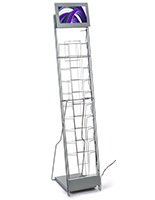 Most purchases include some sort of transport case to make traveling much simpler. 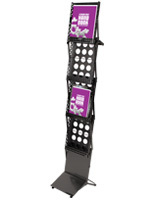 The padded bags are easy on the back of the user and help increase the life of the display. 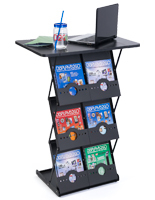 There are also certain configurations that include bonus features, such as a tabletop for extra work space or a sign holder for specifying what the rack currently has to offer. 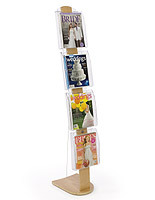 These types of extras make the metal, wood, acrylic, and mesh magazine holders much more practical and functional.